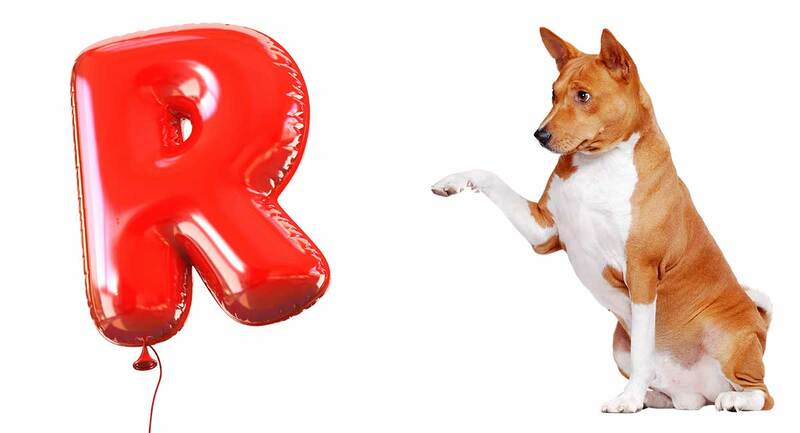 Welcome to our guide to dog names that start with R! Have you just adopted a new puppy or rescue dog? Congratulations! There is almost nothing as exciting as bringing home a new furry friend. Chances are your house is all prepared and pooch-proofed, you’ve stocked up on food, treats, and bowls, leashes and collars, cozy bedding, and a plethora of toys. The perfect dog deserves the perfect setup, right? Now there is just one thing left to do. Pick out the perfect name! Picking the right name for your new puppy or rescue dog can be challenging for a number of reasons, but it can also be super fun. Still, if that elusive one-of-a-kind name for your one-of-a-kind pup has you pulling your hair out, then you’ve come to the right place. Especially if you have an affinity for R names. Whether you’re a family of R-named folks or you just like the way the letter rolls off your tongue, you are going to love this list of awesome R names for dogs. We have funny R names, unique R names, and everything in between! Before we begin, let’s talk about naming that pup of yours and why a little consideration can go a long way! Picking out the best name for your new dog is supposed to be fun, but you should also take some time when making the decision. Keep in mind that this is a name you will be repeating often. If you enjoy being silly and are dying to name your pet something off-the-wall like Armadillo Pants, for example, just be sure this is a name you won’t mind calling out in public. Chances are, you’ll be taking Armadillo Pants on walks, to the dog park, and to the vet. Remember, other people will be hearing this name. And it will likely be deemed a reflection of your personality. Something else you may want to consider is the number of syllables in your dog’s name. Did you know that the number of syllables in your dog’s name may contribute to how slowly or quickly he catches onto it? In fact, dog names with only one syllable, like Rex, or dog names with more than three syllables, like Armadillo Pants, are likely going to be a bit more difficult for dogs to learn. Two-syllable names seem to be easiest for dogs to pick up, with names like Harper and Cody being the easiest for a dog to remember. Curious about more dog-friendly names? You’re in luck. Just click here! Or keep reading, because we are about to load you up with some of the hottest R names available for dogs! Wondering what the hottest R names for dogs are? Well, wonder no more! Below you will find a list of twenty of the most pup-ular dog names that begin with the letter R.
While this is a list of “female” dog names, we would like to point out the obvious—there are no rules here! If you find a name you absolutely love on this list, but you have a boy dog, who cares? Name away! These names are strong, sassy, and full of personality perfect for any gender! Come check out an even larger list of more female dog names here! As we mentioned in our female names list above, just because this list is titled “Male Dog Names” doesn’t mean it can’t work for female dogs as well. Behold this powerful list of masculine sounding R names perfect for your pooch! And to check out even more dog names for males, click right here! Some dogs just have that special something about them, don’t they? Although I admit, every dog I’ve ever met has had that special something. Still, if your dog is a notch above the rest, then this is the list for you. Each and every R dog name on this list is filled with enough swag to keep Fido feeling fly. Not sold on these wickedly cool R names for dogs? That’s fine. We’ve got tons more for you to check out, just pay us a visit here! Forget cool. Your dog is cute. And we’re not talking cute like aww, we’re talking cute like aww-dorable! And if you’re on the hunt for the world’s cutest R name, keep reading. But beware—these R names are so cute, you just might melt while reading them. If you have somehow survived becoming a puddle, then here is an even larger, more extensive list of delightfully cute dog names just for you! Click here! This list is one of our favorites. It’s for the witty, the funny, the oh-so-punny. Whether your dog is a natural comedian or you are the one who is super into cracking jokes and evoking giggles, this list will have you in stitches. If your doggo sidekick needs a funny R name, then get ready to laugh! There is nothing like staying up on what’s hip and in, but it’s also crazy cool to start your own trend, don’t you think? And while we are absolutely bananas about all the funny, cute, and cool R dog names listed above, they may not be as unique as you would like. Don’t worry. This is your list of totally one-of-a-kind dog names that start with R. Ready to stand out? Then get to reading! If this list of uber unique dog names didn’t tickle your fancy, that’s okay. We’ve got even more unique dog names you should take a look at. Click here for an entire article of over 100 unique and totally out of this world dog names for you and your four-legged friend. Looking for a tough dog name that starts with R? Then we have you covered! Whether you have a German Shepherd or a three-pound Chihuahua, these tough sounding dog names will either add a bit of fun irony to your lovebug of a pooch or let people know this pup means business. Here are twenty of the roughest and toughest dog names that start with R.
Looking for an even tougher sounding dog name for your dog? Come visit us here! R names are fun to say, versatile, and great for both humans and dogs! Did you know that one of the most common and famous dog names around is an R name? That’s right! We are sure you have heard of the name Rover. Rover has been a common dog name now for centuries. It comes from a very interesting source. While many a dog has been named or nicknamed Rover over the years, the name actually derives from the early 1700s, when hunting dogs were commonly called by this stellar R name. Other popular R names from the time that didn’t catch the same fame train as Rover but are still just as cool include badass names like Ruffler and Ranger. R names are also popular in the two-legged world as well, with some of our favorite celebrities sporting names that begin with R.
Harry Potter’s Rupert Grint, singer Rihanna, and the 40th US president himself, Ronald Reagan, are all R name celebs. So, now you know your R named dog is going to be in good company! Now tell us, which names did you like best on this list? Drop us a note in the comments below! Thanks for all these names! Now, my new puppy is now named Radar. He loves it, I wanna thank you all so much for helping me. Thanks very much!